We want to assure you this property operates in compliance under Law. It is not a time share. This is a shared ownership, which is not a new concept. It helps offset the common expenses between the member/owners. Ownership is held in an LLC. The governing document is called an operating agreement. This sets out the rights and responsibilities of each member/owner. When you schedule the use of the property, prior to any use of the property you must be assigned an membership/ownership interest in the property through the LLC, thus you will become a member of the LLC with a right to use the property. This online platform is utilized because there are many beneficiaries/members we use this online platform/portal for scheduling and booking of this property on a first come first serve basis. 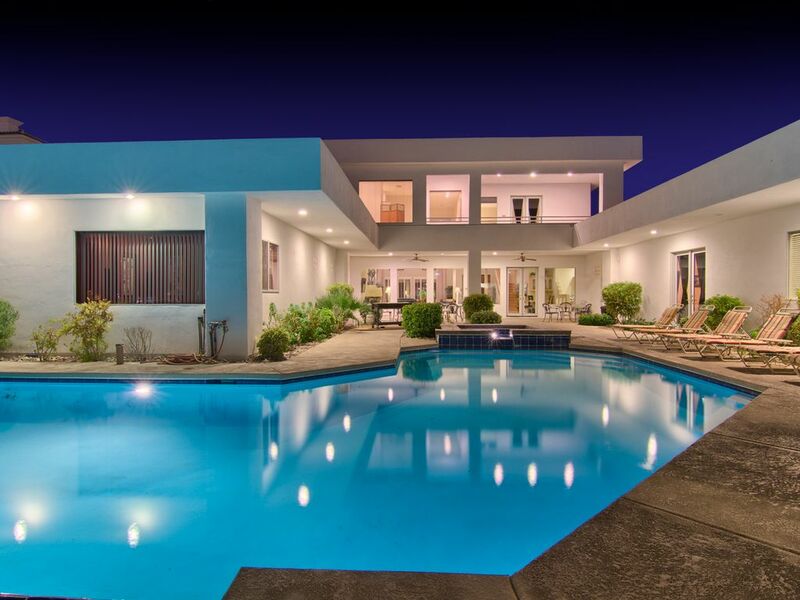 Located on the fashionable West Side of Las Vegas, only 5 miles from the Strip, this majestic 7800 square foot Contemporary Villa sits on almost a full acre gated lot. Extra parking is available on the property to accommodate a total of 5 cars. You can gather in the vast private courtyard with large covered patio, lounge chairs and pool. Or play tennis and basketball on the private regulation-size tennis court with high-tech tile surface. A covered, double-wide circular drive brings you to the entryway where you can easily unload your luggage. Elaborate wrought iron gates and travertine stone tile floor welcome you to the front door. This beautifully renovated Villa has an open-concept living area expanding over 1500 square feet with exquisite marble tiled floors and a pool table. The owner has spared no expense to provide all HD TV channels throughout the property on large flat screen TVs. Walls of 10 and 20 foot floor-to-ceiling windows run the entire length of the room at the front and back of the home. The living room provides ceiling fans, high end leather furniture, a fireplace, new 75” LCD TV, beautiful customized recessed lighting and speakers in the ceiling, and a full spectrum view of the large covered patio looking out onto a magnificent infinity edge pool with spa. The covered patio has ceiling fans, 3 large patio tables and a double-wide BBQ. Enjoy the lush landscape, palm trees and Vegas weather in the many poolside lounge chairs. Swim in the enormous sparkling pool with depths to 9 feet. Or just relax in the lovely heated spa. Appreciate the oversize gourmet kitchen with granite counters, double oven, electric stove top, double-wide custom Sub-Zero refrigerator/freezer, and a deep extra long breakfast bar that comfortably seats 9. An open dining table sits by a built in, granite topped, lighted china cabinet. Lovely Brazilian hand-scraped cherry hardwood covers the bedroom floors and ascends up a glass-lined staircase to a private master suite that encompasses the entire second floor. This Cal King master has a fireplace and sitting area, with a large window looking down on the open living area below. French doors open to a private covered patio with seating area and a travertine tile floor that looks out on the pool and hosts spectacular views of the whole Las Vegas Strip in the distance. The huge master bathroom has a luxurious jetted tub, large seated sauna/steam shower, a kitchenette, and more French doors onto the private patio. The expansive walk in closet offers a large island to unpack your suitcase. On the main floor is a second master bedroom with fireplace, double queen beds and sitting area. The ceiling is stunning with romantic hand painted classical artwork. French doors open onto the pool. An airy attached bathroom sports another large jetted tub, seated sauna/steam shower, and walk in closet. The south wing has 3 more bedrooms with double queen beds, en suite bathrooms with large walk in closets, as well as features such as LCD TVs, French doors to the patio/pool, and a view of the pool and tennis court. This property has a total of 12 large beds and 8 roomy bedrooms connecting to 6 full bathrooms. There is also a powder room, and a separate spacious shower room that exits to the pool. The large detached family suite casita has a couch and LCD TV, 3 queen beds, a small kitchen with 6 seat dining table and full bathroom. Sliding glass doors open to the patio to enjoy your morning coffee by the infinity edge pool waterfall. All the beds are dressed with new luxurious bedding. We provide pool towels and plenty of thick bath towels, hand towels, and face cloths. The gourmet kitchen is fully equipped with MrCoffee coffee makers, many small appliances, and plenty of tableware. The property is meticulously cleaned and maintained. Experience the sophistication and grandeur of this amazing Contemporary Villa. Sheree and Diana were the best with quick and clear communication. Sheree met us at the home, walked us through all the amenities and was super helpful to answer all our questions. The home was clean, organized with plenty of soft towels for everyone. Plenty of pool towels, hair dryers, alarm clocks, and kitchen utensils. We needed to replace the tennis balls, once they are hit over the wall, you can not retrieve them. We had 13. Family of four stayed in the casita with one bed in the main room, two bedrooms with queens, a bathroom, and a kitchen area. King in the master upstairs (too many stairs for grandma) with a steam shower and plenty of room. Beautiful bedroom off the kitchen on the main level with plenty of room for two to four people. The other side of the home has three bedrooms, totalling six queens. We did not heat the pool, due to our busy schedule, however, if you divide the heating cost with the group, you would have a great time! Plenty of chairs and areas to relax. The home is gated and we felt very safe. The location is a quick 15 minute Uber ride to the strip $20 - $30. Red Rock Canyon and Downtown Summerlin are quick easy drives. Plenty of stores and restaurants close by. We had a wonderful time!! I would recommend and if we ever need a large home in Vegas, this is it! Great spacious well appointed home very nice location. Beautiful home amenities were all as described and the owners and property manager were very accomadating and professional. No complaints. Everyone in our group of 8 was highly impressed. About 15 min Uber or car service to strip which we went to often due to this being the reason for our visit. The grill pool and hot tub were put to good use. Thanks look forward to staying again. The property was just as described and very clean and well maintained. All questions were answered clearly and timely. It was a great option for 8 of us to each have our own room and enjoy the pool and tennis court. It was about a 15 minute cab to the strip and about 20 to Freemont which did add up since we did not rent a car. However it was walking distance to a couple grocery stores so it all balanced out. I would definitely recommend the house to others and will consider booking this house again. Heated pool and spa available at $200/day, or heat the spa only at $50/day Cancellation Policy: If cancellation is received more than 90 days before arrival, the refund is 75% of the Total Rental Fee. If cancelled between 90 days and 60 days before arrival, the refund is 50%. If cancelled less than 60 days before arrival, the refund is $0.